Shadowgun - Android's most anticipated 3rd person shooter game was released on the 26th Of October by Czech games developer - MADFINGER Games, the same developers that brought you Samurai II: Vengeance. The game sports mad visuals and a cover system just like the Gears Of War series - some have even said that this game looks and feels like Gears Of War. 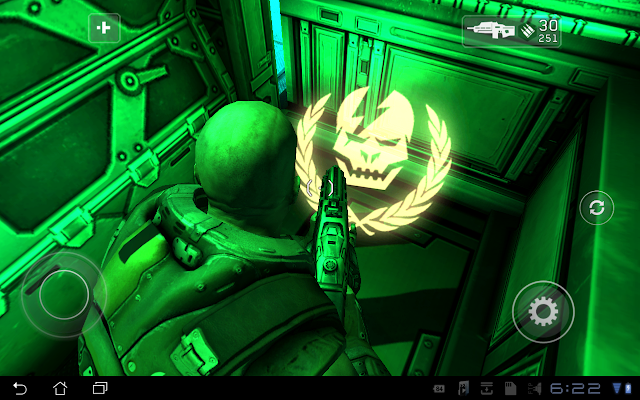 Currently ShadowGun is a Tegra 2 exclusive but will soon be released for non-tegra devices as well as the developers optimize it for non-tegra chipsets soon. 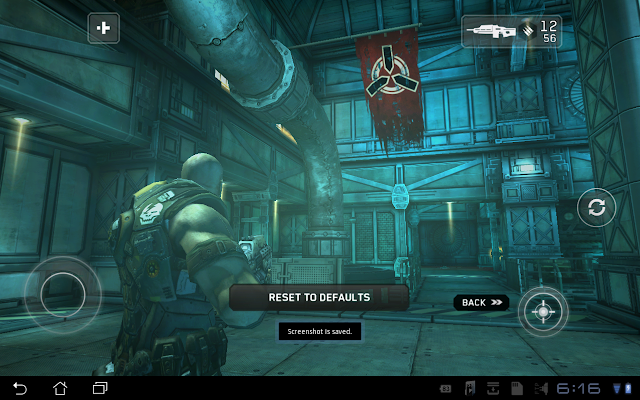 Or you could sideload it and use ChainFire 3D to play the game on your non-tegra device. This review covers the game's graphics, gameplay, AI and control mechanics. Check out the full review of the game after the jump. 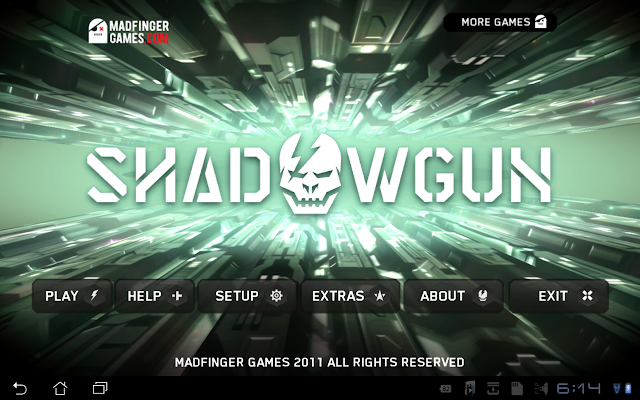 The game is currently a single player only affair but MADFinger Games did a great job in the overall presentation of the game and even brought in some really good voice actors to act the parts of John Slade, the Shadowgun bounty hunter and other characters in the game such as S.A.R.A - Slade's personal assistant. There's also some really nice in-game CGI cinematics thrown in which really makes this game a true masterclass production for a mobile game with console-quality graphics. Like every other modern FPS, this game does not have any health bars in it. You can tell if your health is critical by seeing red all over the screen, that tells you to back off, find cover protection and regenerate your health. This eliminates the need to find the usual "bandages" or "health kits" lying around the maps which can be rather distracting to the game's objective and overall gameplay. 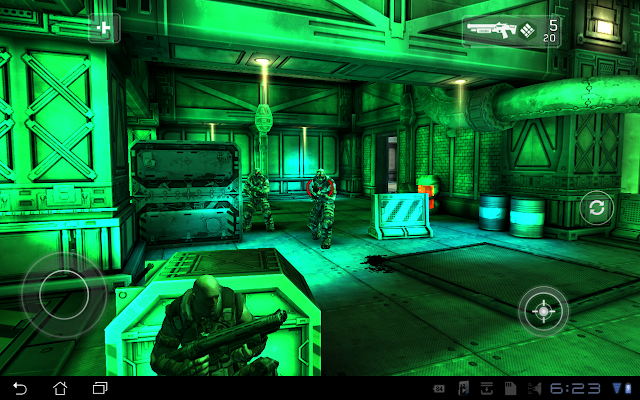 In Shadowgun, you get to battle all sorts of enemies - cyborgs, battle droids, genetically mutated humanoids and more. The AI is not exactly that great considering that you'll be spending a lot of time trying to pan the camera and get your aim right, which is a good thing because if the AI is too difficult to battle with, you'll definitely be frustrated to death. There are a total of 10 levels in ShadowGun which has roughly around 3-5 hours of gameplay depending on the level of difficulty you play on and that could easily multiply once you go to a higher level of difficulty. 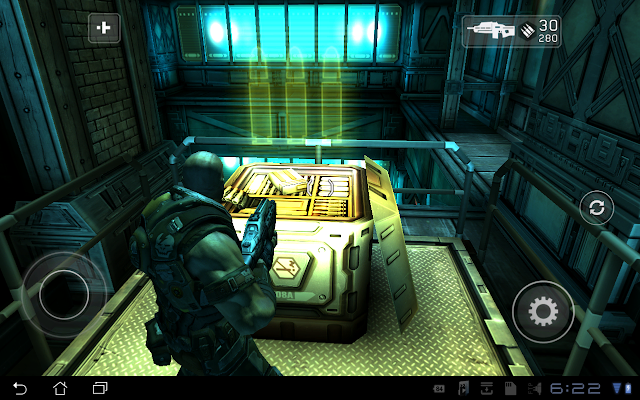 The graphics in ShadowGun will blow you away. Never have I seen graphics like this on an Android device - it looks really good on my ASUS EEE Pad Transformer tablet and hooking it up to my 32 inch LCD TV via the mini-HDMI connector just made my day even better. Only one word to describe the graphics - gorgeous. Absolutely Gorgeous. Gameplay is pretty good overall, you get to go into cover a lot which helps in a game like this where it is actually quite tricky to control the crosshair to aim the enemies and timing it right with your shots. Some covers are destructible although not fully, you will end up taking more damage by enemy fire as the cover gets more exposed. There are some puzzles in the game as well for instance some doors or areas can only be unlocked by "hacking" which actually plays a random sequence of numbers (for example 4-2-5-3-1) in which you have to remember and punch back the correct sequence. Each wrong attempt will increase the alert level until the bar fills up and you will probably get enemies swarming at you. Other puzzles include shooting yellow glowing targets to bring down ladders, doors, etc. In the game, there are also boss levels where you fight some huge bosses or try to take down a driller by using your wit (rather than guns). We don't have that many "boss" level fights in today's modern FPS, so its actually surprisingly fun to see ShadowGun include them. Good stuff indeed. It is cleverly placed in hidden spaces around the map although it should not be too difficult to locate them. Now lets talk about weapons - the game has 4 different weapons to choose from. You start off with your trusty rifle/machinegun (or whatever you want to call it) and as you progress, you will be able to get your hands on other cool weapons such as shotguns, grenade launchers and finally - the rocket launcher. Those weapons are pretty standard issue and you will be able to find them in weapon crates that you have to use your "use" or "action" button to open the crate to reveal the weapon and pick it up. Ok, its time to talk about the controls. There are 3 ways you can play this game and control your character. Lets go through them one - by - one. Lets start off with the first control method - the touchscreen. As you can see from the screenshots, you will notice the on-screen controls which consists of a pause/menu button at the top left, a weapons switcher/selector button at the top right, a static move pad or free move pad style virtual joystick control, a fire or "use" action button at the bottom right corner and a reload button slightly below the right center of the screen. With a static move pad, your "virtual joystick" stays at a fixed position while with the free move pad, you're not limited to where you can use your virtual joystick. You can tap and hold anywhere on the screen and move in the direction you want your character to move to - as long as it is on the left-half of the screen. On the other right-half of the screen is where you pan the camera freely - anywhere on the right half of the screen. You won't get any visual cues but you will know it when you notice your camera pans (of course). Now if you're not comfortable with the placements of the virtual joystick and buttons, you can actually customise the layout - many might not be aware of this actually because you have to be IN the game in order to do this by pausing the game and accessing the settings section. You cannot do this outside the main menu. The above screenshot shows you how it looks like, you can drag the controls to anywhere you like to make it easier for you to reach and feel comfortable with. Especially on a 10.1 inch tablet, you might want to move the virtual joystick, fire / action and reload buttons nearer to the left and right side of the screen so that its easier for you to reach especially if you have short fingers. The second control method is with a gamepad. According to many, the game works great with the Xbox 360 Controller (wired) and possibly other popular controllers such as Logitech's Rumble Pad. You can customise the gamepad controller configuration in the game's setup menu just like in another Tegra 2 game - RipTide GP although I would say in RipTide GP, it is more extensive and the gamepad controller support is the best that I've seen in an Android game so far. The third and final control method that many do not know or are just not aware is by using the keyboard. I've tested the game out on my ASUS EEE Pad Transformer keyboard dock and the game works great - so I believe it should work on other keyboards such as bluetooth keyboards. The keys are fixed and cannot be changed which I hope MADFinger Games adds in a section to customise this as the game feels easier to play with a keyboard. You can control everything with the keyboard including panning the camera, moving your character around, selecting weapons - etc. The only exception is you still need to use the touchscreen to perform the "hacking" operation where you get the random sequence of numbers that you have to remember and key them in the correct sequence. 1 - Start "hacking" or "select" number in hacking puzzle. Use arrow keys to move selection. 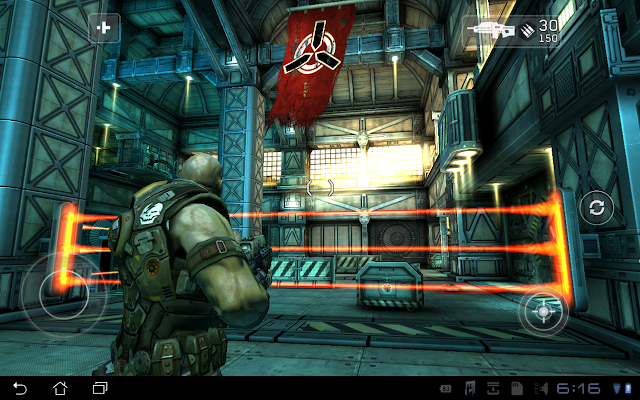 To put it simply - ShadowGun is an excellent 3rd Person Shooter for the Android platform. The game is beautiful thanks to the Unity 3D engine that it was developed on. While the AI could use some polish and there are some minor graphical issues on rare occasions, there's no doubt that this is one really solid game that is worth paying that $4.99 for. I did wish the game had more levels as I managed to finish the game pretty quickly on the normal setting and there's currently no multiplayer mode in this game which would add some decent replayability to the game but there are news that the folks at MADFinger Games are indeed working on a multiplayer aspect of this game although no word on when it will be released and whether it will be released as an update or as a separate paid download or otherwise. Make no mistake - this is the game that you want to show all your friends and make them go "Wow that looks awesome!" and to demonstrate the true power of your Android device. As mentioned earlier, the non-tegra version is being developed and tweaked but if you can't wait for that and if you have a Tegra 2 device already, you could buy this game and sideload it to your non-tegra device and try it out using ChainFire 3D (requires root) as long as you have a powerful enough device like an HTC Sensation or Samsung Galaxy S II for instance. So what's our rating for this excellent game? 4 Out Of 5 Stars. When the developers get the multiplayer aspect ready, we will certainly update this review then. It also needs more levels - a lot more. If they could do both of that with a solid multiplayer mode, this game could get the full 5 out of 5 from us. In any case, you should get this game NOW if you haven't already. It is already pretty solid as it is with 3 different control scheme support. Copyright 2011 Android Supernova. Powered by Blogger.